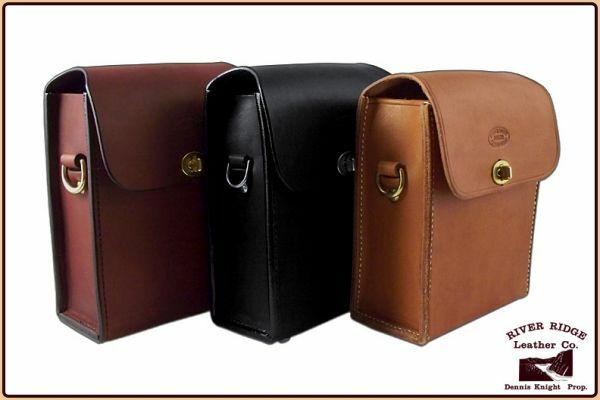 This is a classic River Ridge Leather shoulder bag, inspired by antique cartridge boxes dating back to the 19th century. Made of genuine, traditional vegetable-tanned Bridle and Saddle leather from 100% American hides, it is handmade by Dennis Knight using only traditional leatherworking tools. Available in Black. Havana or Chestnut. Inner Dimensions: 8-inches tall, 6.5-inches wide, 2.5-inches deep. Adjustable strap. Lifetime warranty for workmanship and materials . Note: Because we use only traditional vegetable-tanned leather and make them one at a time, colors vary slightly from bag to bag.